5.12.99--Washington, DC--TV lights in the Rose Garden create the shadow of a PPD (Presidential Protection Division) agent in the colonnade. The President’s PPD agents stand sentinel within close proximity of the President 24 hours a day, seven days a week. 2.19.99--Washington--The translator booth houses a beleaguered interpreter in the back of the East Room while French President Jacques Chirac and US President Bill Clinton make statements during a news conference. 2.25.99--Tucson, AZ--Patrick Briggs, of the White House travel office, fills out the seating assignment cards for the Press Charter plane. 4.9.99--Washington, DC--A diplomatic aide snoozes under a portrait of Henry Kissinger at the State Department just 20 feet away from a joint press conference between Vice President Al Gore and The People's Republic of China's Premier Zhu Rongji. 4.24.99--Washington, DC--The “Photo Dogs” behind the velvet rope in the East Room of the White House during the Nato Summit. George H. Bush, #41, gave the White House Press Corps photographers this nickname during his administration. 5-10-99--Washington, DC--Under the watchful eye of George Washington, White House Assistant Usher Daniel Shanks attends to last minute details for an event in the East Room. 4.13.99--Washington, DC--Organized chaos consumes the Rose Garden before one of many Presidential events scheduled for the day. 5.6.99--Rhein Main AFB, Ingleheim, Germany--A Secret Service agent crosses the tarmac in front of enlisted personnel waiting for a chance to shake the President’s hand. 5.10.99--Washington, DC--Because position is everything in Washington, the White House Social Staff members take seating arrangements very seriously. 5.14.99--Air Force One--A handful of Press Corps members re-enact the previous day's heavy air turbulence on Air Force One for photographer Joyce Naltchayan and those not present for the experience. 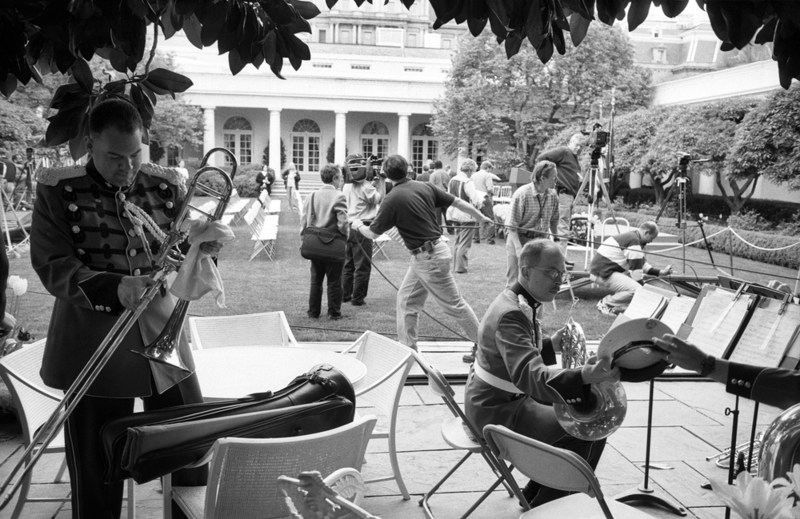 7.12.99--Washington, DC--White House Press staff members relax after hours in the West Wing at a farewell party for outgoing colleague, Michael Teague. 7.6.99--Rapid City, SD--The who's who of Rapid City queue up for a chance to meet the president on the tarmac at the airport. 6.30.99--Chicago, IL--Onlookers inside the Sheraton Hotel catch a quick glimpse of the Presidential limousine as it speeds by en route to the airport. 7.14.99--Washington, DC--A designated member of the Honor Guard Detail adheres to the “leave no trace” policy at the White House by removing chalk place-markers in the driveway after an event for a visiting dignitary. 7.19.99--Washington, DC--A member of the White House Domestic Staff prepares a table on the South Lawn for an event in honor of the Women’s U.S. Soccer Team – just one of the many events scheduled that day. 7.6.99--Clarksdale, MS--On a brutally hot summer day, President Clinton dines on barbecue while the Press interviews the proud proprietor - all under the surveillance of CAT (Counter Assault Team) agents. 7.27.99--Washington, DC--In order to secure a better spot in the OEOB briefing room, members of the press pool opt to ascend four flights of stairs rather than wait on the infamously unreliable antiquated elevator. 8.7.00--Martha's Vineyard, MA--Fox News' Major Garrett dresses comfortably for his "stand up" in the summer heat during one of the Clinton family vacations. 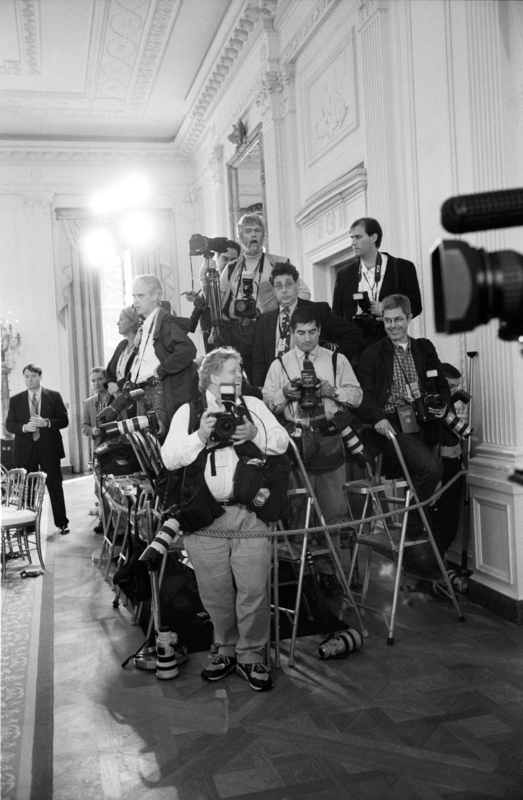 7.27.99--Washington, DC--White House photographer Ralph Alswang photographs Press Secretary Joe Lockhart watching President Bill Clinton during a news conference in the Rose Garden. 7.30.99--Sarajevo, Bosnia-Herzegovina--Ever present but unobtrusive, Clinton’s PPD agent stands guard during a speech to the school community at Treca Gimnazija. 7.31.99--Sarajevo, Bosnia-Herzegovina--Secret Service agents depart after depositing the Press Corps in a war-ravaged building that serves as the Press Hold. 10.8.99--Press Charter--A 50-minute flight from Ottawa to Chicago becomes happy hour for members of the White House Press Corps. 10.8.99--Mont Tremblant, Quebéc--An agent directs the Press Corps to the waiting helicopter after a long day at the Forum of Federations Conference. 10.8.99--Mont Tremblant, Quebéc--Sleep overtakes weary Press Corps members at 2 am, despite the cacophony and lurching of the helo after a grueling 17-hour day of meetings between Clinton and Chretien. 10.13.99--Washington, DC--Marine One makes a landing near the Reflecting Pool on the National Mall at 17th Street, NW. This is now the site of the World War II Memorial. 10.25.99--New York, NY--On duty for the President's arrival via Marine One, members of the New York Fire Department wait at the Wall Street landing zone. 1.25.00--New Hampshire-- Members of the traveling press enter a Gore campaign event. 3.17.00--Washington, DC--The view from behind the President's desk, offering a perspective on what Clinton sees. 8.28.00--Arusha, Tanzania--Locals roll out the red carpet at the Tanzania airport for President Clinton's arrival for the Burundi peace talks. 9.23.00--Chicago, IL--Constituents gather at a Democratic National Committee fundraising event featuring Al Gore. 9.26.00--Ann Arbor, MI--A Secret Service Agent and his sweep dog share a moment of affection on the tarmac near Air Force 2 at the Willow Run Airport. 10.13.00--The White House--Doug Band, President Clinton's personal assistant waits just outside the Oval Office. 10.13.00--Washington, DC--The Press Corps gather around Press Secretary Jake Siewart for the morning gaggle as the Middle East peace crisis heats up again on the heels of the U.S.S. Cole bombing. 10.16.00--Sharm el Sheik, Egypt--A member of Egyptian security stands along the motorcade route during the President's arrival for the Middle East peace talks. 11-01-00--Orlando, FL--Miranda Cartland, a Gore campaign press aide checks into a hotel at 5:00 am, two hours before the 7:00 am pool call. 10.11.01--Arlington, VA--Even Commodores must pass through the magnetometer to enter the Pentagon for a September 11th anniversary event one month after the tragedy. 3.20.03--Washington, DC--Pete Souza makes a picture in the White House briefing room before the arrival of the Press Secretary hours after the bombing of Baghdad. 5.14.04--Mequon, WI--More than the usual number of secret service agents surround the President at the Concordia University commencement ceremony. 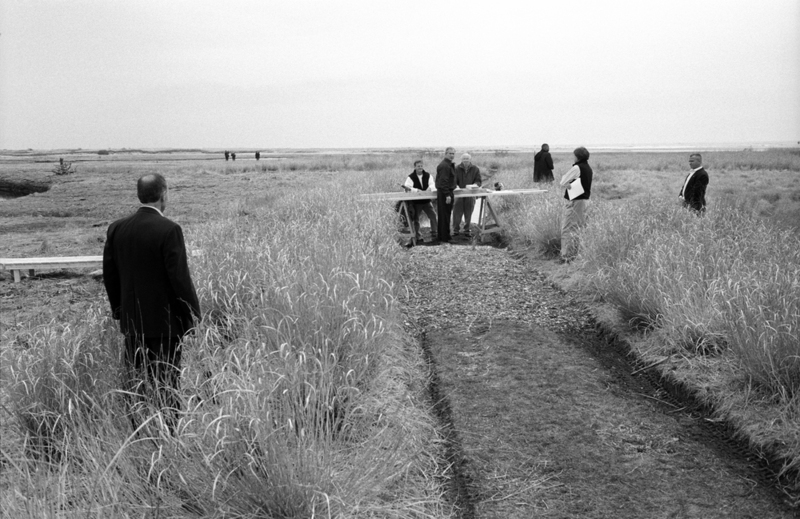 4.22.04--Wells, ME--At the end of a freshly mown path in the Wells National Estuarine Research Reserve, President George W. Bush and his guests prepare for an Earth Day photo-op. 5.8.03--Washington, DC--A member of the White House waitstaff takes a break in the State Room at the end of the Cross Hall from the East Room.